Leave us your name and email address! We will update on new arrivals and more.. All comments will be screened. Hi Girls!! 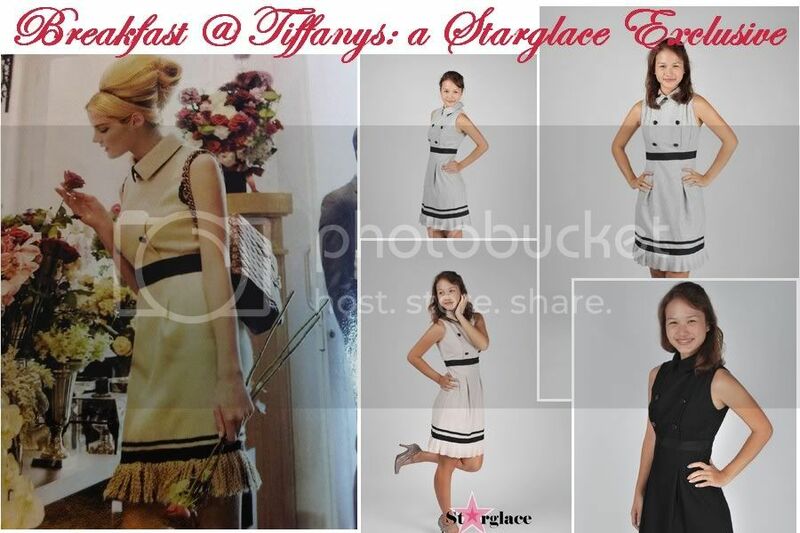 We have drafted & visualised the "Breakfast @ Tiffany's" dress for quite a while now but we must say that it was definitely well worth the wait! :) This Chanel-eque dress caught our eye in a magazine, screaming "Classic", "Glam" and "CHIC"!!!! And....we are taking in Summer with just a lil' bit of Sunshine, featuring CCC - colourful, chic & cheery numbers! Don't forget to tune in to the launch happening this Saturday 6 August at 10pm but in the meantime, do not be shy to drop us an email at starglace@gmail.com for enquiries or PRE-orders! t's highly stretchable, up to 20" for PTP but snug enough for the petites.. 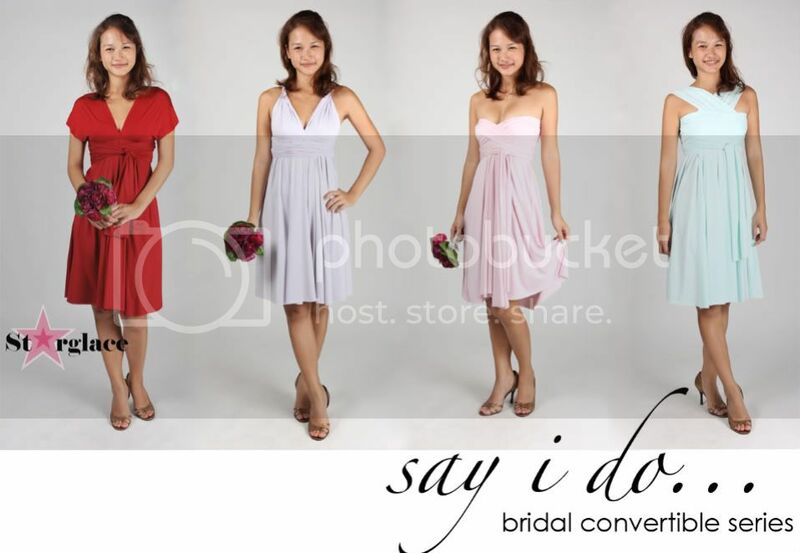 Please see previous launch of this dress at Flirty Flare - The Convertible Dress for more details. P.S. We will not be posting anymore pictures of this dress as we are finalising our new website which we have targeted to launch in mid August 2011! So exciting! But this dress is for sale NOW so please do drop us an email at starglace@gmail.com for enquiries or orders! Hi Girls! We know it's spring and a splash of colour is all over the runway but we decided to stick to neutrals for our first spring collection.. easy to wear pieces to add versatility to your wardrobe. We hope you girls will like these.. see ya on Sunday! Hi Girls!! It's been a while since we had a launch. We do apologise for the long hiatus.. Wendy & I have been busy with work and personal commitments. But we're gonna be back with more launches so keep us in your shopping list! 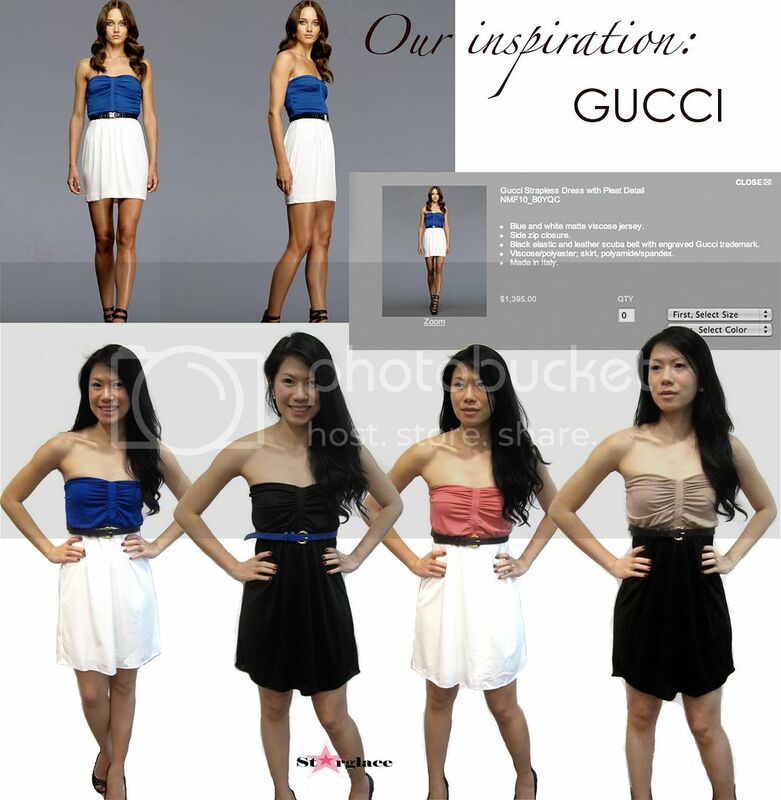 We present 2 self manufactured dresses for this collection and a range of vibrant coloured dresses for CNY. Our self man includes a halter inspired by Alice & Olivia and a lovely sweetheart dress by DKNY. Material and workmanship for these 2 pieces are really good. So happy shopping! Collection 31 - We love Gucci!! Hi Girls, We love simple glam dresses... and we hope you girls will like this! Available in electric blue, sweet coral, classic black and autumn brun. As usual, do send your orders to starglace@gmail.com. Email orders will be served first. Collection 30 - Starglace Self Manufactured DVF Dress - Launched! Hi Girls, a small collection of pretty colourful dresses for work and play... as usual, do send your orders to starglace@gmail.com. Email orders will be served first. Collection 27 - A Splash of Colour!